The 112th and final hero has now been ported over from the original DOTA. 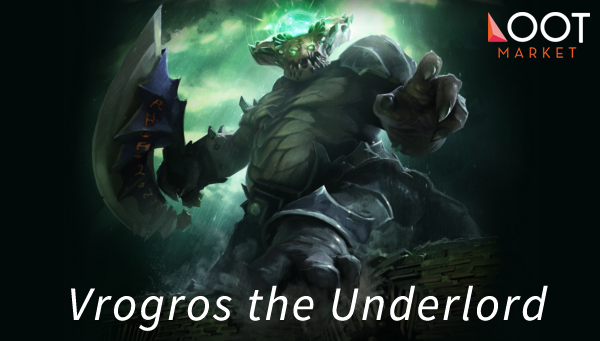 Underlord (aka Pitlord) is somewhat of a durable support, with quite an amount of crowd control. That makes him out to be a good offlaner, though you can lane him pretty much anywhere depending on your choice. Seems like his role isn’t quite set in stone yet. I will discuss his skill-set, his possible roles, pub trends, and what seem to be the most optimal builds at this early stage. This is his main disable, has the same cast range and duration as Firestorm plus an AoE of 275 and there you have a combo. Reveals invisible units inside the Pit for the duration, disables channeling spells (though you can start channeling after the initial disable), and disables mobility spells like Blink Dagger, QoP’s/AM’s Blinks, Phase Shift, Teleportation, etc. His signature spell. You want Io’s Relocate on steroids? Here you go. You want another hero for r[A]t Doto? Here you go. It may not seem as flexible as Relocate (due to restrictions, being able to teleport only to allied creeps/heroes and buildings) but it has much more possibilities to be a game deciding one. Always keep in mind Dark Rift goes on cooldown if you cancel it during cast so only do it when you are sure about it, 2 minutes of cooldown is quite a bit. I’m only going to cover offlane as I find it best suited for Underlord, but feel free to try out any other build you like. You want to solve your mana problems as soon as possible and an occasional rotation to the nearest camp should be much nicer with an Iron Talon. Am I purchasing a Bottle? If you intend to rotate a lot then yes, but keep in mind Underlord is not an amazing ganker. Your rotations will probably be for an early push. Am I upgrading Arcane Boots into Guardian Greaves or going for Boots of Travel? Work this out with your allies, but if you do a lot of 5 man pushes I’d take Guardian Greaves. Then later on go with the flow, all of the items I listed excel at sticking with your team and pushing. Do we have a lot of melee heroes / summons? Do we have Vladimir’s Offering? If not, get it. The enemy team is struggling with mobility in teamfights (e.g. they have an Ursa or similar)? – Get Shiva’s Guard. Their Disco Cow is destroying us? Get a Pipe. There are two skill builds for Underlord. They vary depending on your offlane situation. Most of the times you want to start off with Pit of Malice on level 1, then, depending on your lane on top, decide your next move. Can you stay in the lane and get experience and some last hits with Firestorm? Go with build one. If not, go with the second build. Aura is great once you hit the woods. Jungling Underlord isn’t that hard, especially with Iron Talon and a couple of levels. It will be interesting to see how Underlord’s pub trends change and if he will reach competitive play (I mean if Techies did it…anyone can). Happy Pitlording everyone!